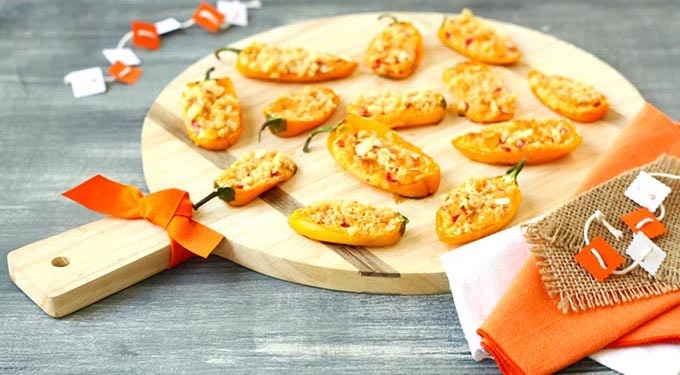 A pastry bag or a zip-top freezer bag make filling the peppers a breeze. Stuff the peppers one day in advance. Cover and refrigerate until ready to bake. Preheat oven to 375°. Cut peppers in half lengthwise; remove seeds and center membrane. Cut a small sliver from pepper bottoms, if desired to keep upright. Place on a lightly greased foil-lined baking sheet. Combine Cheddar and next five ingredients in a large bowl. Pipe filling into pepper halves. Do not over fill. Toss cracker crumbs with butter; sprinkle over the peppers. Bake 20 to 25 minutes or until cheese melts and the peppers soften.